Interested to know more about bots? Check out our chatbot cheat sheet about how they work and most common use cases. Serving over 335k customers in 190 countries, SAP is one of the largest enterprise resource planning software vendors in the world - in fact, it’s estimated that 75% of all global business transactions come in contact with an SAP system. With so many businesses relying on its products every day, SAP came to Tangent with a brief to improve the online management and sales of its huge catalogue of complementary training materials. When we started this project, the catalogue section of SAP’s Education store was flagging; it had a high bounce rate, next to no dwell time and most importantly very low conversion. Our solution needed to both address these issues and automate the process behind future catalogue updates, to avoid high operational overheads and reduce stale content. 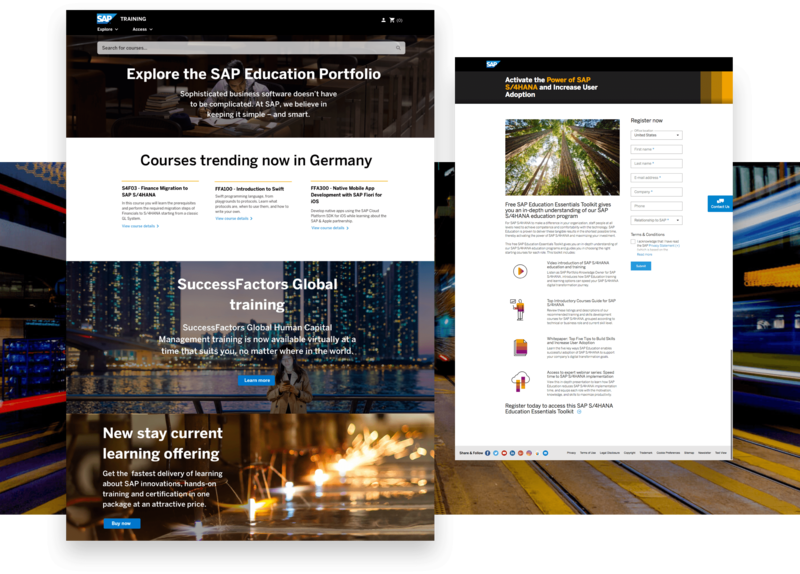 Following an extensive research and discovery phase including competitor analysis and customer testing, our refreshed vision for SAP Education delivers a whole new experience for both Customers and SAP’s global and local Digital Managers. By logically reordering content and employing a system of progressive disclosure, the site turns SAP's complex offering into a simple tool for all users.